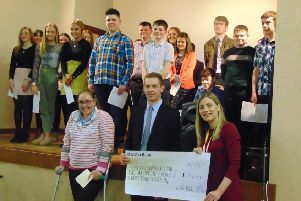 On Tuesday, January 22nd 2019, Rathfriland YFC held their annual general meeting, this year chaired by Benjamin Allen from Collone YFC. The club would like to thank all outgoing office bearers and committee members for their dedication and effort over the past year and wish them all the best for the future as well as congratulate the following club members on taking up their new roles mid April within the club committee. Committee Members: Rachael McMinn, Colin McMinn, Victoria McCabe, Christopher Simpson, James Hunter and Hannah Cromie. Alison Gracey has held the position of secretary for the club for the past four years, however has stepped down this year to go on her travels. The club and committee of Rathfriland Young Farmers’ Club would like to thank Alison for all the hard work and effort she has put in during this time and wish her safe travels. On Friday, February 15th, Rathfriland Young Farmers’ Club are hosting a Valentines Social with the evening’s entertainment provided by Embrace Socials. Doors open at 7.45pm and the event starts at 8.15pm. There will be a small entrance fee of £5 which will include a light supper. This event will be held in Rathfriland Young Farmers’ Club Hall, Downpatrick Street, Rathfriland, BT34 5DG and is open for all age groups. Everyone will be very welcome. For more information follow the club on Facebook at Rathfriland Young Farmers’ Club or call Alison Gracey on 07938877089.